Dale, a retired community college administrator and instructor, is an avid hiker, backpacker and cyclist. At the age of 67, he now spends most of his free time hiking through the backcountry of Oregon and California alone and with fellow backpackers. Like many hikers, Dale often worried about connectivity during his travels. This is why SPOT piqued his interest when reading one of his favorite magazines. Soon after, Dale visited REI to purchase his first SPOT device. In celebration of Memorial Day, Dale and 7 other hikers ranging from ages 51 to 74 decided to take a five day trip to Mattole Beach Campground near Petrolia, California. This time, he made sure to add his new SPOT Gen 3™ as a "must bring" item. Bill, current President of Ruby Valley Search and Rescue and a "retired" Army pilot, is an avid hunter and fisherman. Needless to say, Bill spends a lot of time outdoors; he jokingly states he knows most trees on a first name basis. Several years ago, Bill developed a preparedness plan, which included having a SPOT device. He even developed a messaging system for friends and family on his contact list: (1) Check In message in the morning and evening to family and friends, (2) Check In messages back to back to let them know he got an elk, and (3) Check In messages back to back to let everyone know that he was headed out of the backcountry. Duane and Keith are an active and experienced father-son climbing duo. Safety is always a priority, which is why Keith decided to purchase a SPOT Satellite GPS Messenger™ to take on their outdoor adventures. On one such adventure, father and son were climbing Handies Peak in Colorado when the pair's day took a life-threatening turn. Duane began to experience severe chest pains and could not continue. At almost 14 thousand feet, storm clouds gathering and spotty cellular coverage, Keith pressed the SOS button on his SPOT device. Several friends headed out for a quick lap of kayaking in California's Cherry Bomb gorge. Gear packed and ready for the water, Ben, who had bought a SPOT Satellite GPS Messenger™ a few days before, tossed the device in his backpack as an afterthought. "The camp was only 10 minutes away and it was just a quick trip," recalled Ben. "I didn't think we would need SPOT, but I figured I've got it, I might as well take it." Ben, sidelined from a previous injury, watched from a ledge as his friends passed by. 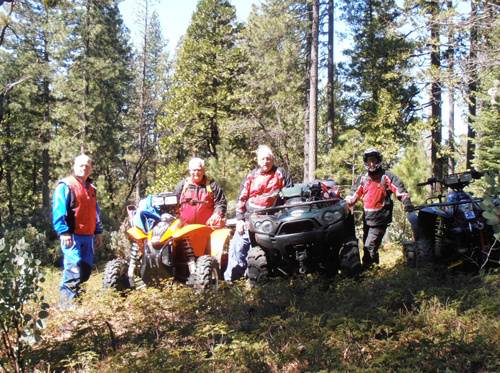 Frank and three of his friends got together for a day of off-road riding in the California forest. The friends were all expert quad riders, knowing both their vehicles and the terrain. With packed lunches and dressed for cool weather, off they went to explore. Along the way, they encountered a large log and decided to ride across it. Frank successfully crossed first, followed by Sam. While crossing, Sam accidentally hit his throttle wide open. His quad bucked sideways and Sam's friends watched in disbelief as he fell 70 feet.